KATHMANDU, June 23:The incessant rainfall that has continued for the last three days throughout the country will last for the next couple of days, according to meteorological officials. 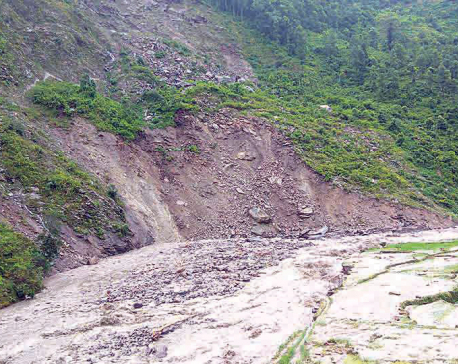 Officials at the Meteorological Forecasting Division (MFD) under the Department of Hydrology and Meteorology (DoHM) have warned of landslides in hilly areas and floods in rivers. "The ongoing rainfall will continue for next couple of days," said Shanti Kandel, meteorologist at the MFD, adding that the persistent rainfall has increased risks of landslides in hilly areas and floods in the rivers. She, however, said that there will be change in weather pattern and rainfall will cease for some time and then will resume again. The continuous rainfall has delighted the farming community residing in the outskirts of capital as they are busy in paddy farming. But the daily wage laborers like construction workers have been hit hard by the persistent rainfall. 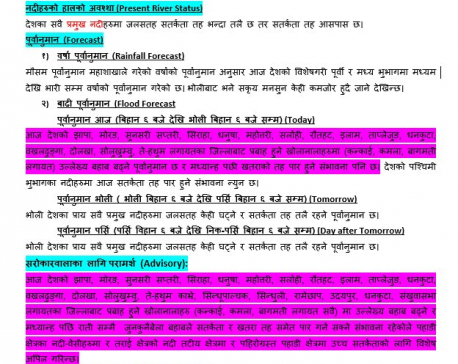 According to meteorologist Kandel, there will be heavy rainfall in Eastern region on Thursday.